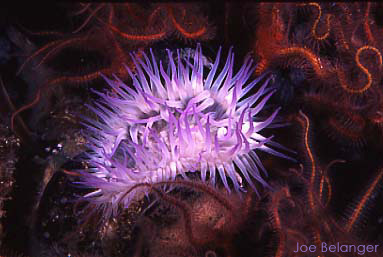 Photographed at Catalina Island using an Ikelite Substrobe Ai and Substrobe M with a housed Nikon F-2 and 60 mm lens. Exposed at f11. 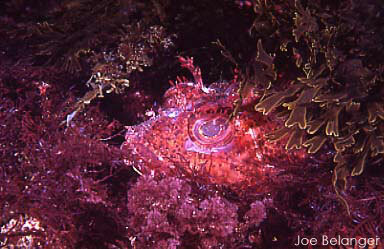 About the scorpionfish: Found on rocky reefs, caves and crevices and blend in well with the reef colors. Easy to approach and poisonous. Range from Central California to the Gulf of California. Size to 176" (43 cm). Photographed using a housed Nikon N90, Nikon 60mm 2.8 macro lens and 2 Ikelite Substrobe M’s. Shot at f32 @ 1/60th on TTL. About: Photographed at oil platform Helen. 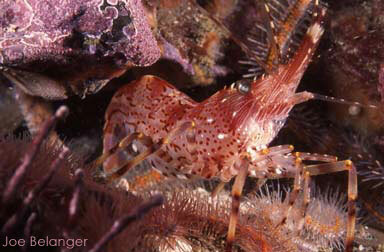 Found solitary or in dense mats on rock faces, tide pools and wharf pilings. Six to 25 centimeters across. Photographed using a housed Nikon N90, Nikon 105mm 2.8 macro lens and 2 Ikelite Substrobe M’s. Shot at f32 @ 1/60th on TTL. About: Photographed at Santa Rosa Island in 90 feet. Found in rocky subtidal zone to 600 feet. To five inches in length and found from Alaska to Monterey, California. Has beautiful coloration. Photographed using a housed Nikon N90, Nikon 105mm 2.8 macro lens with +4 diopter and 2 Ikelite Substrobe M’s. Shot at f16 @ 1/60th on TTL. This is a close up of its body. About: Photographed at Santa Cruz Island. The star has 15 to 24 flexible arms and moves very fast. Voracious feeders. Color varies from purple to brown. 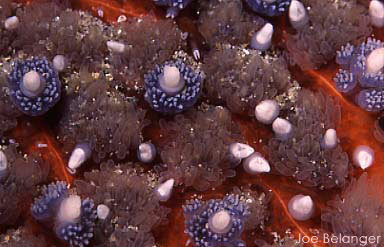 Feeds on abalone, other sea stars and urchins to name a few. Intertidal to 100 feet. Alaske to San Diego.